Adamant Entertainment is pleased to present the first-ever third-party release for The Pathfinder Roleplaying Game from Paizo Publishing, launched at the debut of Pathfinder at GenCon in 2009, and now available again in print! 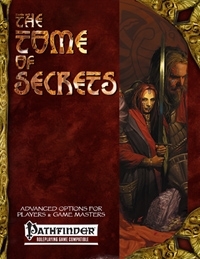 The Tome of Secrets is a collection of advanced and optional rules for players and game masters of The Pathfinder Roleplaying Game. 3 new races, including the Half-ogre, Ratkin and Saurian. Rules for character occupations (what your heroes did before they were heroes). New rules for The Pathfinder Roleplaying Game, including Chases, Morale, Stunts, and more! Game Master tools including a random adventure generator, a monster modifier, and a generator capable of creating over one million magic items!